« Battle Of The Kings Contest. Winner Of Region Of Europe, Middle East and Africa. Published by Cyril Huze June 22nd, 2016	in Customs, Editorial and Exhaust. The duo John Peck, an ex Vice-President of Manufacturing at Vance & Hines and Leigh Crawford. 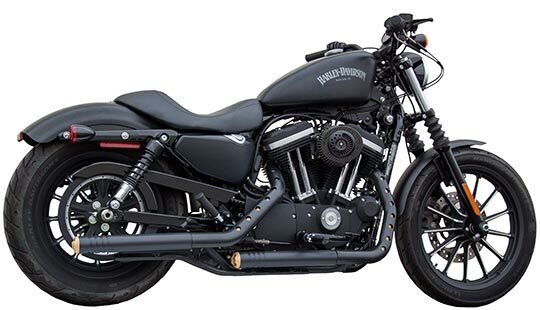 also ex Vance & Hines Research and Development Department, intends to only produce cutting edge exhaust products. Their newest ones are these Sportster Rip-Rod slip-ons featuring retro-styled ripple pipes and caps. 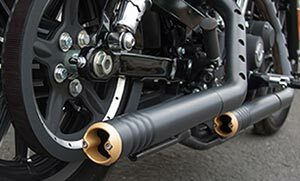 The Rip-Rod Slip-Ons feature 2 ¼” rippled muffler bodies that match up perfectly to your stock heat shields, and are finished off with hot rod style billet end caps for a clean, narrow look. Internally, 1 ¾” maintenance free spiral louver core baffles deliver that distinct classic sound. Damn fine looking pipes !! !